Adventurous and unique as your love story. One of the seven wonders of the world, The Grand Canyon is one of the most popular destinations in Arizona. This land is rich with native cultures, stunning vistas, and muted colors. People travel from all over the world to visit The Grand Canyon and are forever changed from their experience. 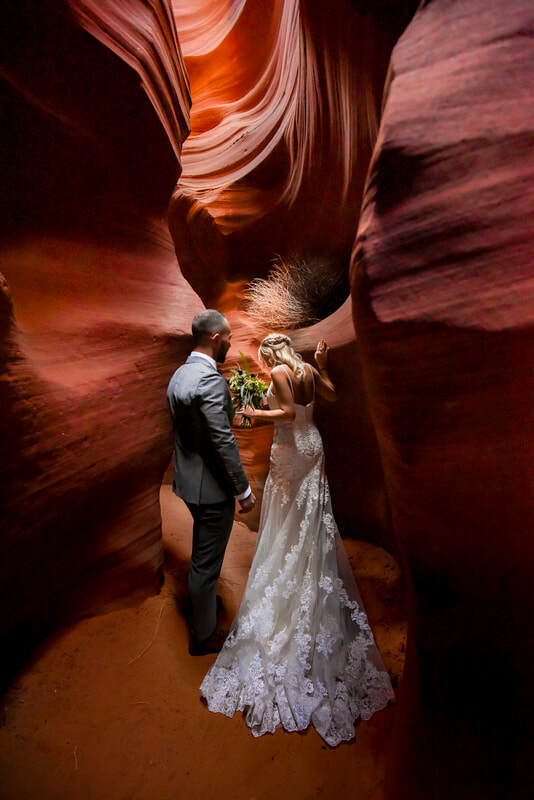 A lot of our couples plan their Grand Canyon wedding from afar. 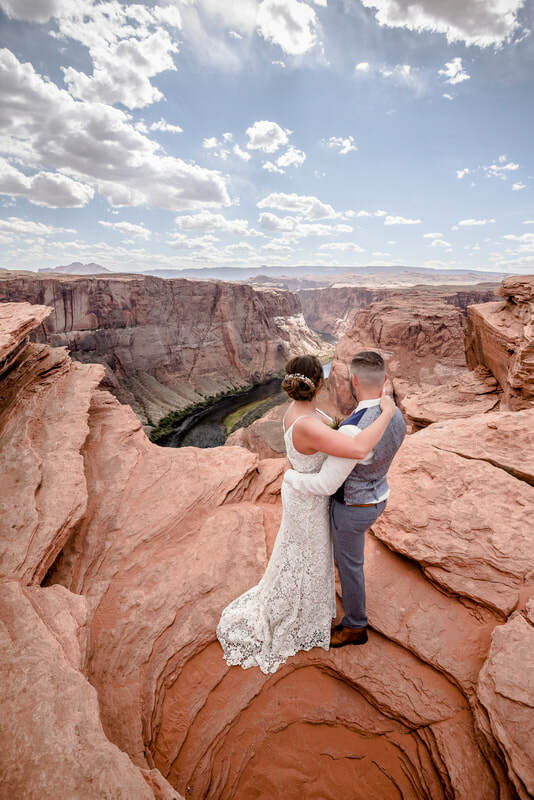 So, whether you are planning a large destination wedding with a reception or an adventurous elopement, we are here to help you with the details. If you're eloping, we'd be honored to be your two witnesses too! 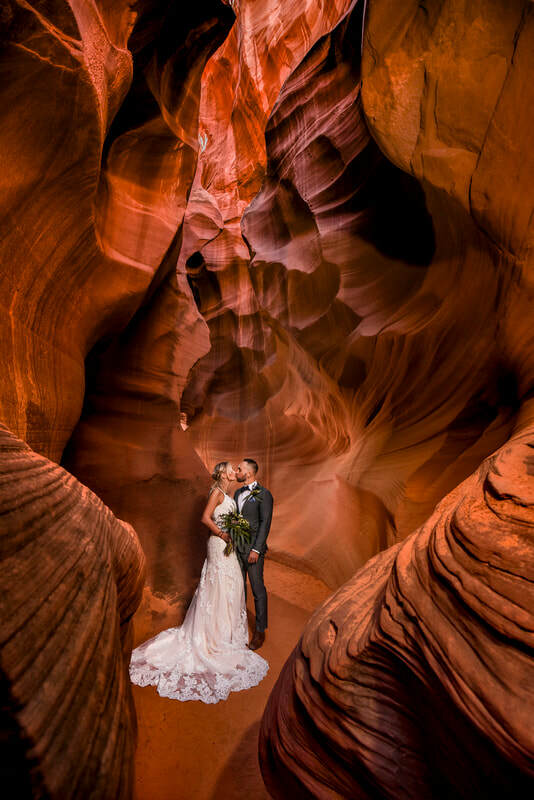 We are a husband and wife wedding photography team specializing in Grand Canyon weddings, elopements, and engagement sessions. It's very important to note that The Grand Canyon is BIG and there are four distinct regions that are nowhere near each other; The South Rim (most popular and offers a selection of permitted wedding areas), Havasupai (epic turquoise waterfalls and logistically challenging), North Rim (only open May-October), and the popular Las Vegas Grand Canyon helicopter wedding on Hualapai native land. 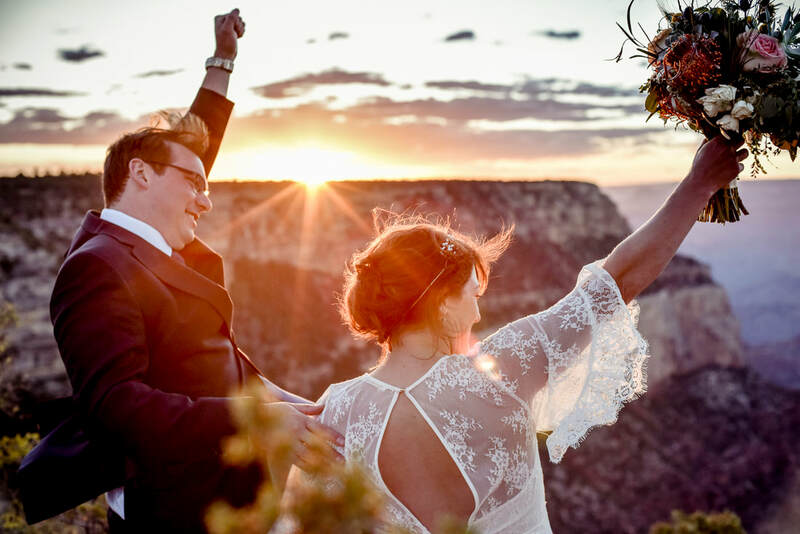 Choosing a location for your Grand Canyon wedding is the first step. Once you have decided on a location, we are here to help you with the planning and wedding logistics. 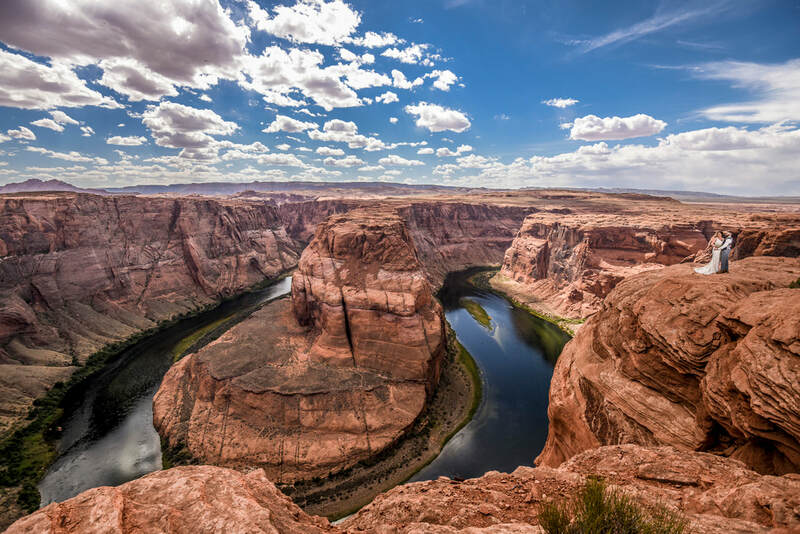 Horseshoe Bend, Antelope Canyon and Lake Powell are located near Page, Arizona (and only a few miles from the Utah border), next to the Glen Canyon Dam. 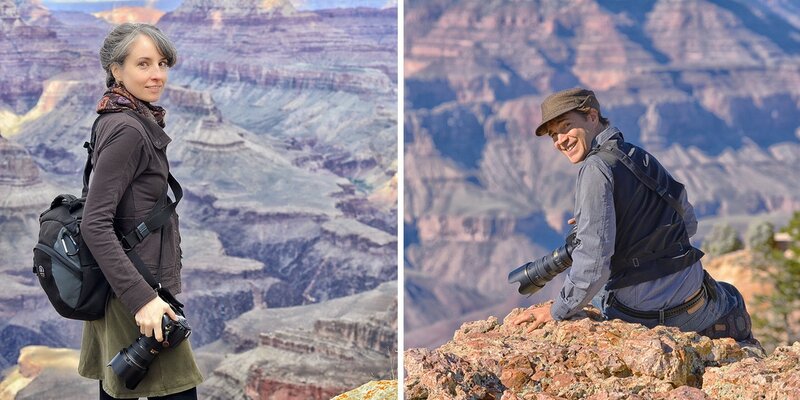 Albeit close, it is not officially part of the Grand Canyon National Park. March 2019 update: There is construction at Horseshoe Bend, and currently there is off-site parking only, where you have to pay to take a shuttle bus to be able to hike to the bend. Allow extra time coming and going for the shuttle bus. 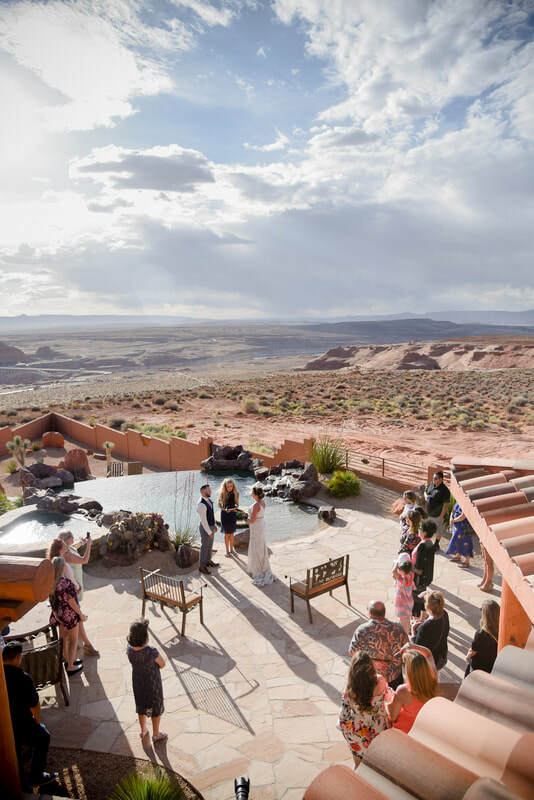 Lake Powell weddings can be at the resort or in a remote area on the lake, on a houseboat, on the beach, or any combination thereof. Temperature wise, mid-September through early-May are the most comfortable months to experience these locations. Winter months are cold. Our clients are creative, unique, and most importantly crazy in love with each other (like us)! We are a husband and wife team who work together to give our clients the very best experience. We love celebrating one of the most intimate day in your lives. We understand that this is a once in a lifetime day and we are here for you every step of the way. Our wish is for you to cherish your photographs for many years to come. Classic, timeless, artistic photography that tells your story. After the ceremony is over and celebrating with your guests is done, you will want to know that your story will be remembered through the photographs of your wedding day. This is the beginning of your love story! Celebrate this moment, as the photographs are the one choice in all of your planning that will live on for generations. We're over the moon!! Your photos are simply spectacular, and we could not be happier. Some made us laugh, some made us cry, and we'll treasure them all our lives. You captured every meaningful detail, and allowed us to see and savor moments we missed in the happy chaos of the day. Your ability to frame the smallest details to bring out their beauty, and to capture the fun and most touching moments is amazing. The colors are brilliant, and there are many images that are worthy of enlarging and framing so we can look at them every day. We cannot thank you enough - this was a very important part of the event, and we're tremendously grateful that you handled it with such skill and professionalism. © 2019. 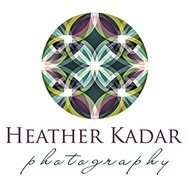 Heather Kadar. All Rights Reserved.